Look what wondered into my cart during a lunchtime Wal-Mart trip (I know, I know — I'm going to hell for shopping there — I only do it occasionally!). 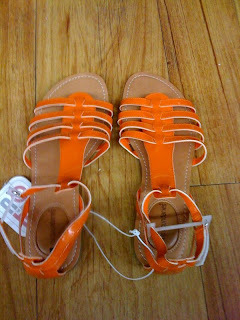 I'd been wanting a pair of fun-colored, flat gladiator sandals. These were $10. I need to get it dry cleaned, but here's my vintage Pierre Cardin silk dress during our Goodwill photo session (thanks for the photo, Mb). Can't wait to bust this thing out! 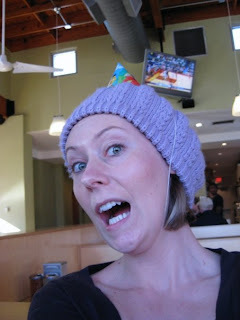 One of my closest friends (love you, Miz Mb) visited from Washington, DC this past weekend. One of her requests was hitting up some thrift stores, as there aren't many near her in her native habitat. So, after sleeping in a bit on Saturday, we ventured out into metro Atlanta. The hunt was on for fun and funky, thrifty finds. I recommended scoping out the Goodwill at Northlake, as it's one of the newer, cleaner of the Goodwills near our house. And boy did our choice pay off! We scoured the racks for pieces ranging from the eclectic and vintage to modern or conservative. My visiting friend found a fantastic black, cobalt blue and pinkish/purple funky button-up with a little tie that goes around (or behind) the neck. Cute find to pair with a skirt or a pair of jeans. I hit the mega millions jackpot. Or at least that's my opinion. For a meager $39.92, I picked up two fab blazers, three t-shirts, some kick-as* sunglasses, a vintage Pierre Cardin silk dress, a lavender knit cap, a simple black dress from Old Navy and an amazing plaid/wool/lined shrug. Mb was the perfect shopping partner, as she handed me things she liked but didn't work out for her. I'm going to try and wear some of my new pieces to work this week. 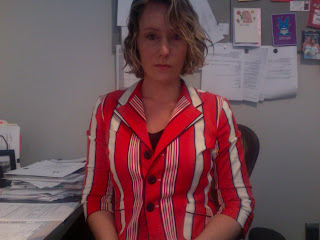 Today it's a Luella Bartley for Target striped blazer — for like $4.39! Saturday may have been one of the greatest days in my life (fantastic thrift finds + our 80's party = awesome). I'm also going to add the blogger mentioned below (DC Goodwill Fashionista) to my blog roll. (CNN) -- After Denise Honeycutt sashayed down the catwalk modeling a sleek sleeveless black dress with a blue lace jacket, she felt so good she bought the outfit. A model walks the runway at the Arlington United Methodist Church fashion show in an outfit from Goodwill. "I got those two pieces and a skirt for $20," she said. "How's that for a deal?" Such bargains may not be haute couture, but during a recession they are a thrifty shopper's dream. As budgets tighten during the economic crunch, buying used clothing is no longer just for fans of vintage wear. Many are discovering the hidden treasures in consignment shops, as well as thrift stores and other places once thought to be only for the destitute. That's a message that Brendan Hurley, senior vice president of Marketing and Communications for Goodwill of Greater Washington, has been working hard to get out. 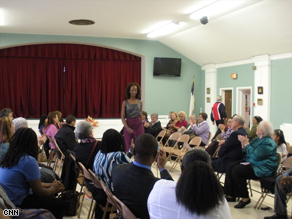 Goodwill of Greater Washington provided the fashions Honeycutt modeled for the show at the Arlington United Methodist Church in Arlington, Virginia, and has been actively campaigning to spread the word that Goodwill fashion is contemporary and hot. "Most people have a misunderstanding of Goodwill's mission and they believe that our mission is to sell inexpensive merchandise to the poor," Hurley said. "In fact, Goodwill's mission is to provide job training and employment services to people with disadvantages and disabilities. We just happen to fund that mission through the resale of donated items at our retail stores." Hurley said things really took off after they launched a viral marketing campaign and the very successfulDCGoodWillFashions blog. Em Hall is the retail marketing manager who blogs as the DC Goodwill Fashionista in a gig that has become so high-profile that she was invited to blog this year from Fashion Week in New York. About once a month on average, Hall and her team put together "travel and trunk shows" where they pull merchandise from their nine stores, put them on rolling racks and take them to events for attendees to shop. "The response has been tremendous," Hall said. "We know that finding that treasure at Goodwill, finding that vintage piece, really resonates with people." Across the country, Goodwill stores have launched several creative ideas to attract divas (or divos) who may have more style than funds. Goodwill Industries of Michiana Inc. of South Bend, Indiana, has "Boutique Days," where they work with local fashion reporter and consultant Kathy Friend to raise awareness that Goodwill can be an excellent resource for brand name and designer clothing. Those who donate at least 20 clothing items receive an opportunity for a private consultation with Friend at a reduced rate. The Goodwill/Easter Seals program in Minnesota held a "Second Runway" fashion show in February where 30 volunteer fashion designers took existing clothes from surrounding Goodwill stores and turned them into hip new outfits. The event attracted more than 500 attendees. "We were given $50 and we could create up to three looks out of things we found at the Goodwill," said designer Kristina Bell, who whipped up a cute little dress out of recycled T-shirts. "I've always been a thrifter, but now it's a really good way to save money." Someone else's hard times can be a fashionista's gain. Denise McShane owns McShane's Exchange, whose two locations in the Chicago, Illinois, neighborhood of Lincoln Park have seen an uptick in those unloading their Prada and St. John. "Business has really boomed," McShane said. "The bad news is that we are in a recession, but I absolutely have had a surge in consigners." McShane said she offers those who still have a cash stash a bit of retail therapy during hard times. They can get great buys at a reduced rate. Such shops, known in the industry as resale stores, have long attracted quality merchandise, said Barbara Nell, owner of The Daisy Shop on Oak in Chicago. Nell said women are bringing in only the best for resale. "Women seem to be cleaning their closets of their most luxurious items," said Nell. "It's not just the bread and butter or staples of their wardrobe anymore." "If you can't buy something new, you might as well recycle and buy someone else's stuff," McElherne said. "I saw that coat and I said 'If it's less than $100 I have to get it.' "
Nicole Mladic is the "babe" behind the "Budgeting Babe" blog for "young, working women who want to spend like Carrie in a Jimmy Choo store but have a budget closer to Roseanne." Mladic said she encourages her readers to not only shop thrift, but also to be generous in their giving. "I make sure to thin out my wardrobe every so often," she said. "Any pieces that I am not wearing, I donate." That type of generosity is much appreciated, especially in the current economy. Melissa Temme, a national spokeswoman for the Salvation Army, said that while the need for low-cost clothing is increasing, donations for such clothing have remained consistent and that could spell trouble. "It means that down the road we may not be able to stock our shelves," Temme said. "In the long term, that's a concern." Katherine Ransom, communications manager for Goodwill of Orange County, California, said that as more people turn to thrift fashions to help stretch their dollars, they are discovering the clothing is a lot more current than they might have imagined. Ransom said even Hollywood types are getting in on the act, as wardrobe consultants for television shows and movies are also perusing the racks for good buys. A recently launched coupon campaign is bringing in even more shoppers, she said. "People are saying 'I've never done this before, but now is a good time to start,' " said Ransom, whose organization launchedshopgoodwill.com 10 years ago. It now includes merchandise from 77 Goodwill organizations around the country. "They are taking advantage of the quality merchandise with really deep discounts." It had been two months since my last trip to see Mary — and my hair had grown a lot! 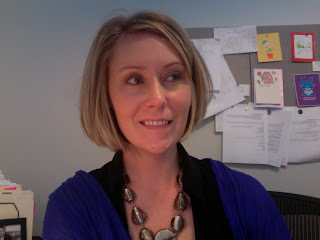 I went for an even shorter bob, this time with a few more layers in it. The layers will help with its shape when I wear it curly. She did similar lowlight and highlight foils except for that she added a third color this time (a few small hints of chocolate brown). Another pleasant visit with Mary. Another very reasonable $120 (plus tip). See original haircut post here. Pretty Little Tangents asked me if I bought the instructional DVD that goes with my dress/skirt. Rats. No, I didn't. I should have, obviously. Her inquiry did prompt me to do a little YouTube video search for instructional videos. I found one here. Unfortunately I am not crazy about some of these "looks," not to mention I'll have to watch each "look" six times before I likely figure it out. *Update: I caved and am sending $5 via paypal to the seller so I can buy the silly DVD.